It was a day to forget at Churchill Downs on Thursday. We knocked out one win and didn’t hit a single exacta wager over the 10-race card. Momma said there would be days like this. 1st: 3-5-7/9-2-1/11-8-10…A.P. Princess (3) ran OK here in September when dropped out of the MSW ranks all the way to MCL $20,000. Although bothered at the start of that ne, she recovered enough to run a solid second. The horse she beat in there, the third place finisher, has already come back to win. With modest improvement, she could be tough in this spot today and the work here on Nov. 2 was solid. David Carroll (the assistant trainer at this barn) will give a leg up to his son Declan Carroll to ride, and the apprentice is doing quite well here this meet. Hush Y’all (5) is one from the Brad Cox barn and will drop significantly for this try today. On debut, she was simply out-classed and never got engaged. Should fair better against these, and the barn hits with .25% racing for the second time and .31% of those dropping like this one is. Franki D Oro (7) showed some speed at Keeneland, when running over a sloppy track. Faded mightily in that try, but gets further class relief today. The barn hits with .16% of those dropping this far, as well. I bet the 3-5 across the board and then box the top 3 in the exacta. 2nd: 1/6-2-5-3…My first Key Play of the Day comes here with Bordini (1). This one is getting a huge drop in class for a top trainer/owner combo, and the 6YO has never been made available for this low a price tag. Has a nice 2-1-1 record in 5 tries over an “off track” and a win at this distance. The only question for me is that he is 0-1-0 in 5 tries at this track. but should fit with these, and gets this track’s top rider in the saddle. I bet the 1 to win/place/show and then key the 1 over/under the 6-2-5-3. 3rd: 7-8-1/2-6-4/3-5…Believeinholidays (7) ran well when converting to the dirt last time out for the barn of Paul McGee. Ended up second that day, with a return to the blinkers, too. Trained great here on Nov. 2 over a muddy track and has 3 seconds and 2 thirds now in 9 career starts. With just a little improvement, he could find the winner’s circle today. Destiny Awaits (8) is a 3YO son of Curlin, who made his first start of 2018 in September. Ran well before tiring late in that one, which was understandable. Now, returns for his second try under the careful watch of trainer Steve Asmussen. The barn hits with .21% of those making the second career start for this outfit. Works OK since the race, and the rider choice is very interesting. This guy is on top of the world right now. Take note. Stuart Hall (1) is getting the blinkers off today, and the barn hits with .25% of those losing the eye candy. He has been out 10 times with a second and three thirds. Likes to pick up the change, and may do it again today. I bet the 7-8 across the board and then box the top 3 numbers in the exacta. 4th: 5-3-7/2-1…Another wide open affair here, and I will spread out once again. My top pick will be Valcove (5). This one has hit the board in each of the last three and has really started to figure out this thing they call horse racing. Won here over a sloppy track two back, and then returned to nearly do the same thing over a sloppy track at Keeneland. Son of Lemon Drop Kid obviously prefers a little moisture in the surface, and is likely to have some again today. Since moving off the turf, this one has been OK. Watch out. Lngtermrelationship (3) was a top pick for me earlier this week, but was scratched out of that race to go here, instead. 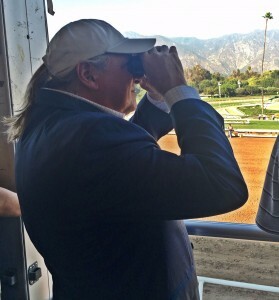 Trainer knows how to spot them, and puts blinkers on for the first time. Has not fared well in the past with the additional equipment, but the last training session was solid. At 6-1 ML odds, I use. Run Tappy (7) gets class relief for this one today, dropping into the pure claiming ranks for the first time. Trainer is 0-for-6 at that angle this year, but this one should appreciate this class relief. Has run well over an off track in the past, too. I will also include Curlins Pride (1) in this mix. First time gelding, after being away from the races since July 2017. Will be interesting to see how he returns, but has run extremely well off the bench in the past. Drops out of a G3 event to this level for the return. I bet the 5 to win/place/show and then key the 5 over/under the 3-7-2-1. 5th: 6/7-10-1/5-2-8-9-3-4…My second Key Play of the Day comes here with It’s Yes (6). This 2YO son of Yes It’s True has run two thirds to start the career for the barn of Brad Cox. Now, he will drop all the way to the MCL $15,000 level — half of what he ran for the lat time out. Trainer hits with .31% of those making this kind of class plunge, and with .32% of those returning to the races as a beaten favorite If the rider can get this one out of the gate and utilize his speed, he may be tough to catch. I bet the 6 to win/place/show and then key over/under the 7-10-1. I will key the 6 over (only) the rest of the numbers in a smaller version. 6th: 8-4/7-5-6-9/1-2-3…Jailhouse Kitten (8) gets my nod in this one for an obvious reason. He has run three times over this course before, with 2 wins and a third. The last two times out, since he was claimed by these connections, he has been overwhelmed by Stakes company. Really good Stakes company. The likes of Channel Cat. Now, he gets a more realistic spot, and returns to his most favorite track. If it stays on the grass, I go here. Create Again (4) would seem to be the most logical choice to put up resistance. This 3YO son of Creative Cause ran for the first time in 10 months on Oct. 17 at Keeneland, and nearly pulled off a nice, gate-to-wire win over a yielding surface at Keeneland. Tired late in that one, which was to be expected. Has come back to work super here on Nov. 4. If he doesn’t bounce here, he could be tough to catch. I bet the 8 to win/place/show and then box the top 2 numbers in the exacta. I will key the 8-4 over/under the 7-5-6-9 in two softer versions. 7th: 4/12-6-8-10-2/3-9-11/5…My third Key Play of the Day. I will go with Wild Medagliad’oro (4), who will be making his 4th career start today. In the fist two, he had seconds against some real nice ones — including Code of Honor at The Spa on Aug. 18. Code of Honor was one of my top picks for the Breeders’ Cup Juvenile, before he was scratched prior to the race. In his first try around two turns here on Sept. 28, he tired and weakened in the stretch. Today, he gets blinkers for the first time and the barn does score with .23% going a route of ground for the second time. Love the recent works. Looks to graduate today. I bet the 4 to win/place/show and then key the 4 over/under the 12-6-8-10-2. 8th: 1-6/3-2-4/9-8-7…Krampus (1) gets the edge in this one, if it stays on the grass. In 6 starts this year, he has 2 wins and 2 seconds and has hit the board in 7 of 10 lifetime tries.. Consistent sort. Comes off a near-miss second at Keeneland on Oct. 12, and will be running strong at the end. Gets one of the best grass riders in the country up today. Giant Payday (6) will be making his second start back here since returning from Del Mar. Has been facing really tough competition, and should appreciate a little lighter group today for the barn of Ian Wilkes. The winners of the last two races have come right back to win again, and this one does have 2 thirds in 5 tries over this grass in the past. Like the 8-1 ML odds. Could spice up the odds rack. I bet the 1 to win/place/show and then box the 1-6 solidly in the exacta. I will key the 1-6 over/under the 3-2-4; and key the 1 over the 9-8-7 in two smaller versions. 9th: 10/2-1-9-3/5-7-6-4-11…My last Key Play of the Day. I will go to the outside in this 6.5-furlong sprint and land on Carrizo (10). This 2YO filly by Paynter was a super impressive winner here on debut in September. Won by over 5 lengths that day in gate-to-wire fashion. The runner-up has already come back to win, and this one goes for a top barn in any stable area. Like the works since the win, and she looks poised to make it two in a row today. I bet the 10 to win/place/show and then key the 10 over/under the 2-1-9-3. I will key the 10 over (only) the other numbers listed in a smaller version. 10th: 6-3/5-10-11-7/1-2-12…I will focus on the top 2 numbers in today’s finale. Serious I Candy (6) gets a huge drop in class to a career low price tag today. Has been away from the races since May, but the trainer does well off the bench — winning at a .22% clip. Has run very well fresh before, and gets a top apprentice in the irons. Cape Time (3) is another getting a slight drop. Before the last run in the slop, she had won two in a row over the grass at Ellis Park. Don’t know what the switch back to the main track, but was wide in the last out and gets a new rider for this try today. Like the work here on Oct. 28. Has a third in two tries over an off track. I bet the 6 to win/place/show and then box the top 2 numbers in the exacta. I will key the 6-3 over/under the 5-10-11-7 in two softer versions.